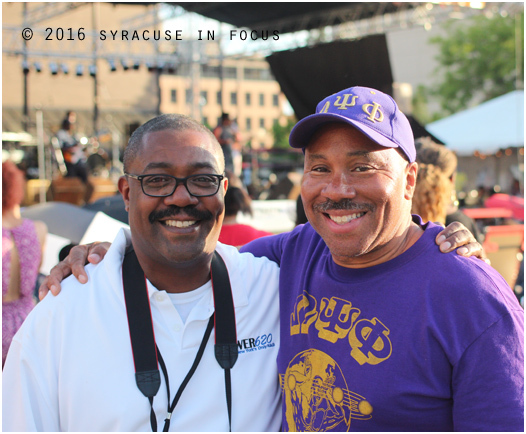 Radio exec Kenny Dees (left) and media personality George Kilpatrick took time to catch up near the main stage at Clinton Square earlier today. 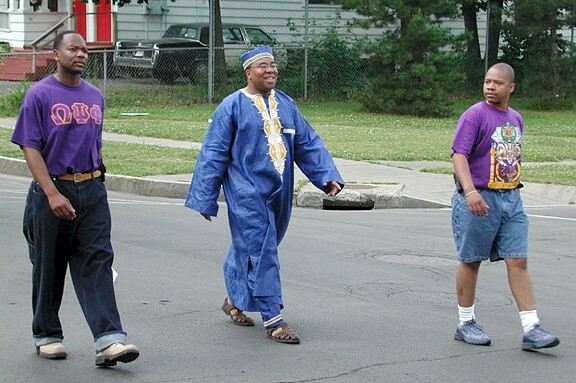 Kilpatrick helped organize the modern Juneteenth Celebration in Syracuse (back when it was held on South Avenue). 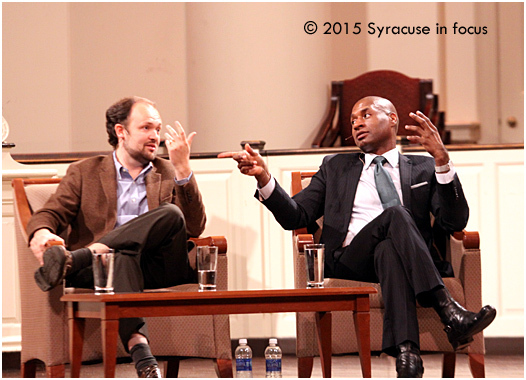 Intelligent Men/Intelligent Dialogue: Ross Douthat and Charles Blow (right) staged a public conversation for last night’s University Lecture Series at Hendricks Chapel. They may disagree on policy, but one thing these two NYT opinion writers pointed out was that redlining and generations of housing policy in American cities were designed to discriminate, segregate and maintain white supremacy. We heard this same point of emphasis at the recent Food Justice Symposium. Blow will be a guest at the Thursday Morning Roundtable later today, which on this occasion is being held on a Wednesday. Moderator for the Roundtable is George Kilpatrick. 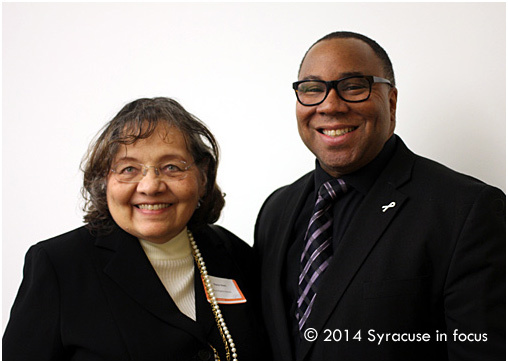 Talk-show host George Kilpatrick interviewed Diane Nash at last year’s Cold Case Justice Initiative. Nash is portrayed in the new film by actor Tessa Thompson. 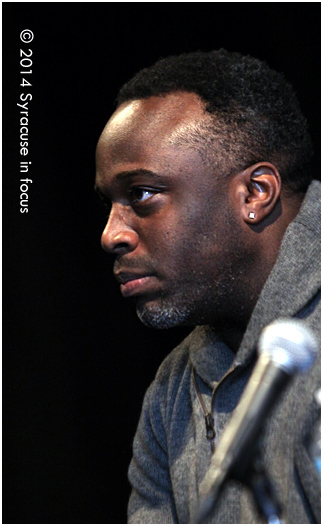 The film “Selma” came out last week (in select cities) and several of the key Civil Right’s leaders active during that march have appeared in Syracuse over the past few years. The roles of Dr. Martin Luther King and his wife Coretta are played brilliantly by David Oyelowo and Carmen Ejogo, but we were also impressed by the supporting cast. Rev. C.T. Vivian was played in the film by actor Corey Reynolds. 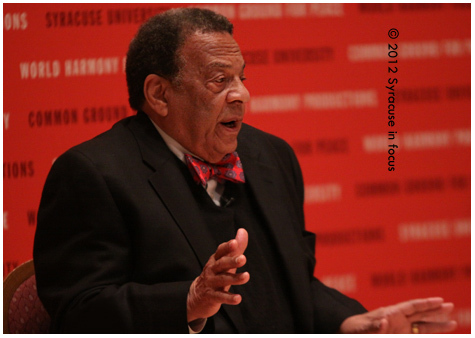 In the film Selma, former ambassador Andrew Young was played by Andre’ Holland. 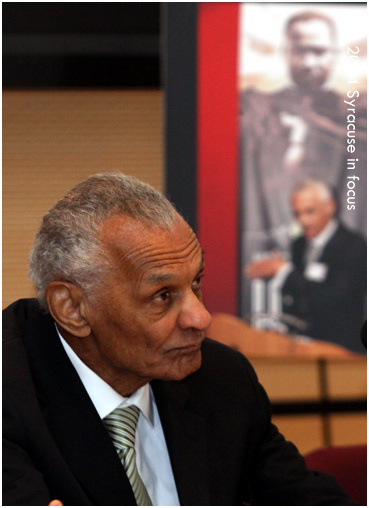 Young spoke at an event at Syracuse University in 2012. 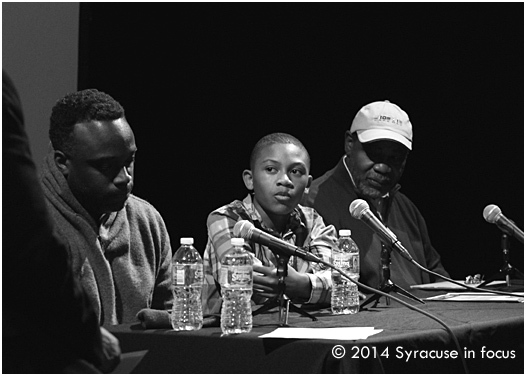 Syracuse Academy of Science 6th grader Raquan Pride II reminded us that maturity has to do with acceptance of responsibility, not necessarily age. Pride participated in the community dialogue at CFAC last night and his eloquent comments often brought elicited surprise and applause. OCC’s Drake Harrison (right) talked about the difference between being a male and being a man during last night’s Question Bridge Dialogue event. 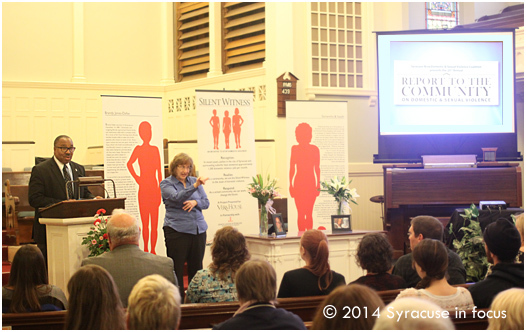 Last night the Community Folk Art Center hosted an intimate discussion related to the Question Bridge exhibit. The multi-generational panel of men tackled topics such as racial pride, the N-word, dating, fears, work, code switching and the definition of manhood. 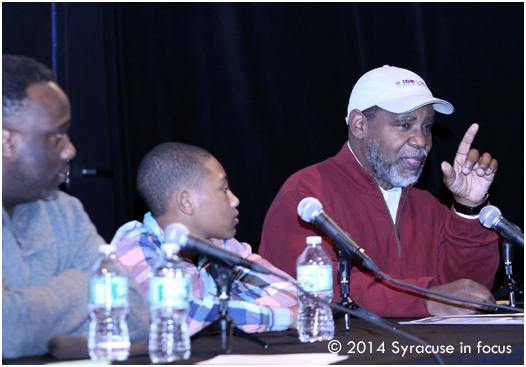 The discussion was moderated by Inspiration for the Nation’s George Kilpatrick. 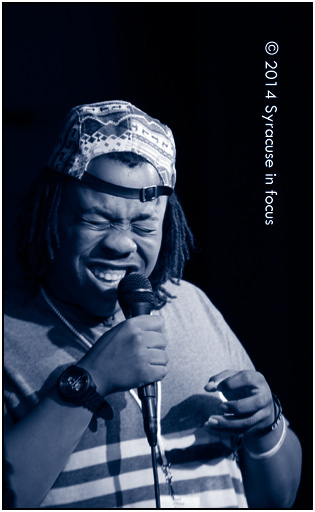 Syracuse University’s Ernest Dailey talked about his trip to Ferguson, Mo during last night’s discussion. George Kilpatrick, Vera House, Inc. Men’s Outreach Program Coordinator, gave statistics during the 25th Annual Report to the Community. 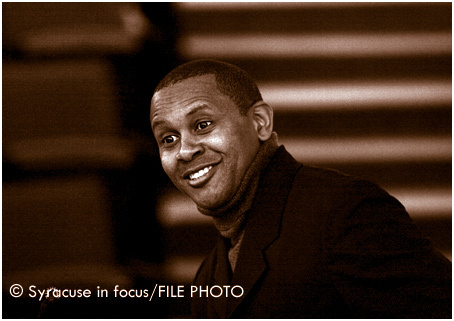 Writer and activist Kevin Powell spoke at Syracuse’s Maxwell School in 2009. Media personality George Kilpatrick says that we can lead from here. To show he’s living up to his word, he recently reached out to BK Nation’s Kevin Powell for a conversation about ending domestic violence from a male perspective. Powell is a familiar, progressive voice on the national networks and in magazines. He is working on a memoir about his journey into manhood. In 2015 he will also publish a biography of Tupac. BK Nation is a 21st Century Civil Rights organization. Kilpatrick also serves as a coordinator with Vera House Inc. here in Central New York. Maybe one of our most under appreciated venues is Jazz Central on Washington Street. Thankfully, during the Northeast Jazz & Wine Festival the stage comes alive with improvisation and the soundscape of creativity. The student performances are some of the best. 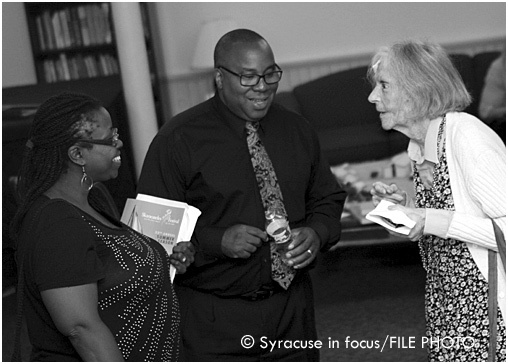 Gloria and George Kilpatrick talk with Karen DeCrow (right) at the Skaneates Festival a few years ago. Former NOW president, activist, and attorney Karen DeCrow passed away last week.